Before you begin the process, learn how to sell a car effectively. With a few tips and resources, you may be able to sell a vehicle faster and for more money. To sell a car, you need to consider pricing, advertising, and negotiating the deal with the potential buyer. The legal process of selling a vehicle is direct. The process to getting to that point is more difficult. In order to price your vehicle properly to sell well, you need to consider your market. How valuable is the vehicle when you think of your intended buyers? Some vehicles, such as family sedans, have a consistently high demand because they are inexpensive and large enough for the family. Vehicles such as sports cars are seasonal. Sell these in the spring and summer for the best response. Trucks and SUVs sell well all the time, as long as they are priced competitively against used car dealerships. Check online and offline classifieds to find what prices are common in your market. Resources such as Edmunds.com can also help you to price the vehicle for your area. Also, price vehicles slightly higher than what you want to get in return for the vehicle to allow room for negotiations. Before placing a for sale sign on the windshield, take the time to clean up the vehicle. A clean and attractive looking vehicle is likely to sell faster and sometimes at a higher rate. Have the vehicle detailed, washed, and waxed. Make any minor repairs you can to avoid having to place an "as is" sticker on the vehicle. Get rid of all of your gear, papers, and other personal items in the vehicle. Clean windows well, since they may help attract buyers or deter buyers when they are dirty. Consult your mechanic. Request a vehicle inspection report to show potential buyers when they come to look at the vehicle. Visit Carfax.com to obtain a Carfax report for the vehicle. This shows buyers that the title of the vehicle is clean. Have maintenance records available to show when you changed the oil or had other repairs completed. Most people make the decision to buy a vehicle or not to as soon as they see the vehicle. By cleaning up your car, you have the opportunity to draw people in from the street to see it. With your vehicle ready to sell, the next step is to let people know the vehicle is for sale. Both online and offline advertising can work. Simple methods of advertising, such as placing an ad in the daily paper or putting up an ad on the bulletin board at a supermarket, work very well. Put the vehicle in front of your home with a for sale sign in the window, too. With online advertising, consider websites such as Edmunds.com or Auto Trader.com. Online advertising has become effective. Many people go online to research and learn about options before hitting local markets. Keep wording simple and to the point. Take phone calls from prospective buyers, and return calls quickly. As you learn how to sell a car, keep in mind that the entire transaction comes down to the moment when a potential buyer looks at the vehicle. Avoid overselling the vehicle or promising that the vehicle has more than it does. 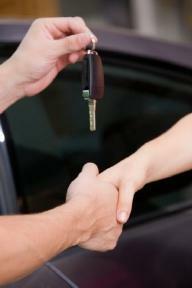 Allow buyer to test drive the car only after ensuring the person has a valid driver's license. Ride with them. Answer questions honestly. If you do not know the answer, find it for the potential buyer. Negotiation is often the most important part of the transaction. Take advantage of the lead-ins the buyer offers. If he says, "I like the car, but" this is an opportunity for you to ask how much the buyer is willing to pay for the vehicle. Once a buyer agrees to the purchase, there are a few more steps to finalizing the sale. You should request cash or a cashier's check for the payment from the buyer. Document the odometer reading at the time of the sale. Sign the car's title over to the buyer. This may require going to the Department of Motor Vehicles for notarization. Selling a vehicle in this manner ensures you retain no liability after the sale of the vehicle. Avoid transactions where you provide the vehicle to the buyer without the title and money transfer. Selling your car is easy if you make sure you show off your vehicle's best features and are up-front and informative about your car's history.